Getting ET Home Costume for Under $20! 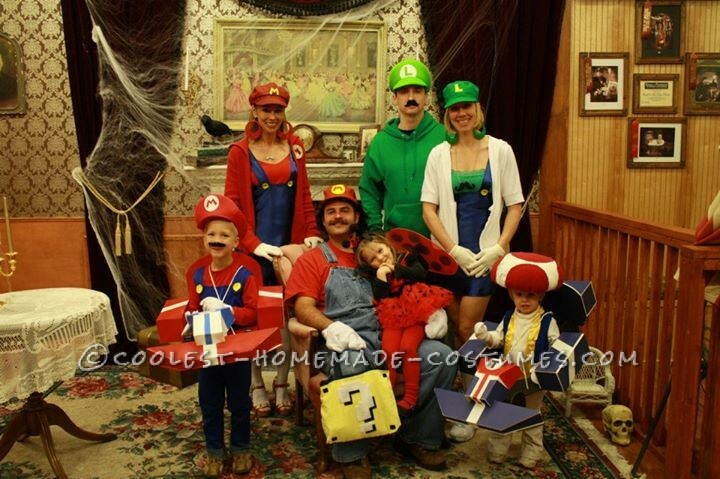 My family loves Halloween and our ultimate goal is to be the standout family. This year we decided to be the Mario Kart family and have carts for the two boys. For the women’s outfits I sewed jumpsuits that were out of blue material and sewed on 2 yellow buttons made out of felt and made sure to make the red X’s out of thread. We found old hats at the thrift store and spray painted them to match our outfits and I made the Mario M out of yellow felt also. The outfit wasn’t complete without the mustache necklaces. For the “real” Mario (that’s what everyone kept calling him) we just got a pair of overalls and a red shirt and found a crazy wig for him. He had already grown out his mustache for the costume. 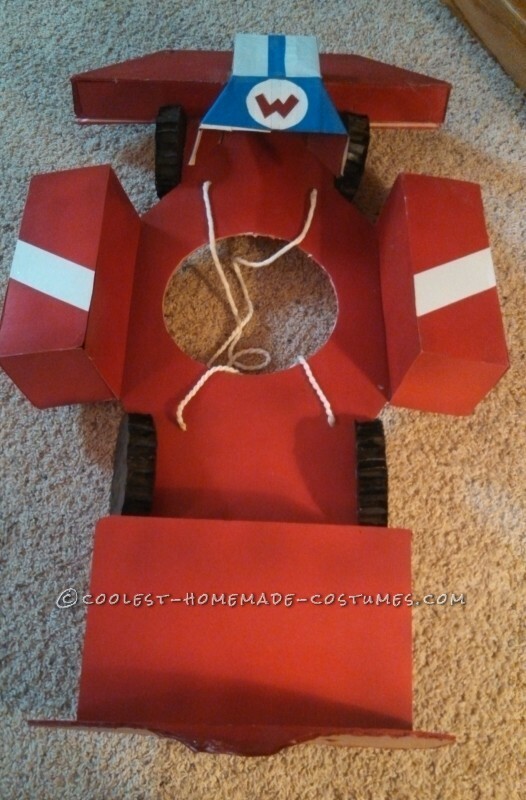 For little Mario, we make his costume like the girls and was simple since so much work went into the cart. I made his cart out of cardboard and foam board. I made his first and found it was difficult to make it exactly how I wanted out of cardboard. I made the bottom of the cart first and used a big piece of foam board. I took a plate and made a circle in the middle of it and cut it out to make sure it would fit him. Then I cut the edges to make the design for the wheels. To make the front I took a foam board and cut the pieces out and used hot glue to hold it together. This was the most difficult part to make the front smaller than the sides and make it look right. To make the sides of the cart I just used a cardboard box that was already the size I needed and hot glued it to the foam board. I used a cardboard box for the back and I also cut out the seat. For the wheels I used cardboard and used small plates to make the correct size. I put them on the foam board using dowel rods and hot glue. I spray painted the cart before I hot glued everything and for the design I used duct tape. When I made the cart for Toad I only used blue foam board and it looked much better because it was already blue and looked nice with the white lines the foam board created when I would cut the pieces. To make Toads outfit we used a blue t-shirt and cut out the sleeves and front to make it look like a vest and added gold stripes. The hat was made using a bowl that fit his head and we used 2 tube socks and filled it with plastic bags. We then wrapped it around the bowl and used a t-shirt to cover the tube sock and filled the middle with more plastic bags. We used a red shirt and cut out the spots and hot glued it to the shirt. To top off the excitement of the Mario family we had to make Halloween bags that had a question mark!! To make the question mark we used both white and black felt to make it have a 3-D effect. We used little black squares on all 4 corners. All the Mario family wore white gloves. These costumes were awesome and everyone loved us. We had complete strangers take our pictures and when we had professional pictures taken that night, they told us we were the most epic group they had seen all night. The kids loved driving the carts and everyone would always stop and talk to us and comment that we had the “real” Mario. 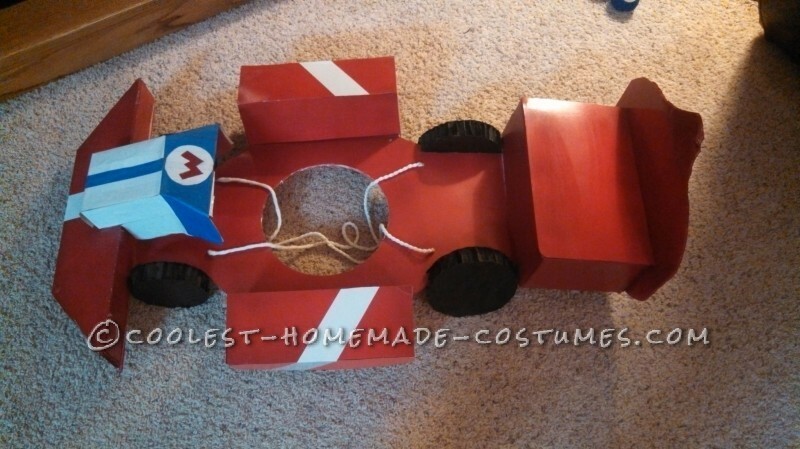 It did take several hours to make the Mario carts but was well worth it. We had the best time and received so many compliments that we definitely want to always do group costumes. We had a little ladybug also. She doesn’t really tie in, but I didn’t have to make the princess outfit and she really wanted to be a ladybug. At least she was in the right color.